New York City wants to host the 2016 Democratic National Convention. What happened the last time a party convention came to town? With support from the Clintons, New York City Mayor Bill de Blasio is making a strong push for Brooklyn to host the 2016 Democratic National Convention. According to reports, city officials have been talking up New York’s “success” in handling past conventions. Success? 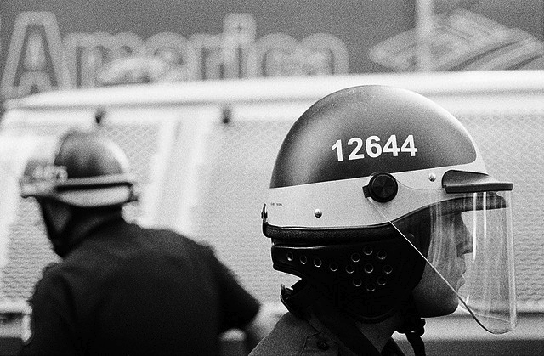 Ten years ago, when the Republican National Convention came to town, there was mass, militarized repression. And the lawsuits stemming from that repression have cost the city tens of millions of dollars. Still, the mayor and his supporters are not the only ones who have glossed over what happened. A decade later, the 2004 RNC is largely forgotten, even in activist circles. Most within Occupy paid little attention to it, instead drawing their lineage to Seattle’s 1999 World Trade Organization protests. Yet they did so to their own detriment: The same regime that presided over Zuccotti Park had already shown its hostility to popular protest. From the moment it was announced in early 2003 that the RNC would be held in New York City, everyone expected a showdown. Activists across the country plotted theatrics, while the New York Police Department prepared to deploy a new range of draconian tactics. That Karl Rove’s 9/11 exploitation show would meet fierce street resistance was never in doubt. And yet, what transpired surprised many. During the RNC, then-Republican Mayor Michael Bloomberg and then-New York Police Department Commissioner Ray Kelly implemented a policy of mass detention, resulting in over 1,800 arrests. While the focus of activist ire was the Bush regime, it would be a mistake to view the event as simply a matter of party politics — or as less radical than the Occupy movement. What took place outside the convention was hardly a John Kerry pep rally. The leading RNC activist groups took aim at the fusion of corporations and the Pentagon, exemplified by Halliburton and Blackwater. And for a brief moment, there was unity among liberals and leftists. All were joined in the common purpose of getting Bush out. At the RNC, that goal was linked to ending the war in Iraq. Though the effort failed that November, such antiwar sentiment continued to shape U.S. politics in the late Bush years. The protesters’ various battle plans for 2004 invoked different legacies. Antiwar coalitions like United for Peace and Justice organized a mass demonstration that harkened back to Chicago ’68. Inspired by the Ruckus Society, adherents to Reclaim the Streets-style direct action tactics looked to Seattle. And street theater performers like Billionaires for Bush drew on their experiences at the 2000 RNC in Philadelphia and DNC in Los Angeles. Kelly was also impressed. He studied the Miami Model, and, in the post-9/11 environment, had plenty of surveillance equipment and other militarized tools at his disposal to replicate it on an even bigger scale. By the fall of 2003, Kelly’s “RNC Intelligence Squad” had fanned out across North America and Europe, spying on any and all activists — from church groups to Ruckus types — who planned on attending the following year’s event. Even though revelations of such comprehensive surveillance wouldn’t come until a few years later, the Bloomberg administration had already taken a distinctly hostile approach to antiwar protest. The city had denied a permit to United for Peace and Justice for a February 2003 march on the UN, allowing only a stationary rally a few blocks away. The following month, Bloomberg allowed an antiwar march, but the UFPJ clashed with the NYPD over barricades restricting access along the route. It was thus clear throughout the planning stages of the RNC demonstrations that beyond simply Bush and company’s agenda, or the war in Iraq, the fight would be about the right to protest on the streets of New York City. Throughout the month of August, lawyers for both UFPJ and the ANSWER Coalition fought unsuccessfully to obtain permits from the Bloomberg administration to hold separate antiwar rallies on the Great Lawn in Central Park. Comparable in symbolic value to a march on the UN, the lawn had been deemed suitable for the Dave Matthews Band to perform a year earlier. But as Bloomberg stated at the time, free speech was a “privilege,” not a right. Direct clashes between the NYPD and activists began the week before the convention. On Thursday, August 27, cops arrested twenty-two people at various sites, including four who had hung a huge anti-Bush banner on the front of the Plaza Hotel. Things escalated the next night when 264 Critical Mass cyclists were arrested — primarily charged with “parading without a permit,” a previously obscure statute — and taken to Pier 57, a toxic former bus repair depot on the West Side Highway that soon became a mass detention center. That Sunday, the UFPJ’s antiwar march produced a truly stunning turnout, which organizers estimated at 400–500,000 but NYPD spokesman Paul Browne later said was 800,000. It was such a massive show of sentiment against Bush and the war that even Rupert Murdoch’s New York Post was impressed. “GOP Bash” read the tabloid’s Monday cover, which showed a sea of humanity carrying multi-hued signs and flags. Among the most common were those of Not in Our Name, which read “We The People SAY NO To The Bush Agenda.” Members of MoveOn and the Win Without War coalition were also well represented. So large was the crowd that day that the mock-counterdemonstration organized by Billionaires for Bush drew over one thousand participants, most of whom were in formal attire. Although the march did not emphasize direct action, the NYPD still made 200 arrests that Sunday, setting the stage for the week ahead. As the convention began on Monday, an unpermitted Poor People’s Campaign march from the UN to Madison Square Garden sparked a handful of violent clashes, although the arrest toll was not significant. But on A31, a day of planned direct action, Kelly’s forces switched gears and started making mass preemptive arrests. Even though the War Resisters League had negotiated a route (that started at Ground Zero) with the NYPD, cops quickly rounded up more than 200 participants on charges of disorderly conduct for blocking the sidewalk. The true theater of action was in Midtown on A31, however. On the streets surrounding Herald Square, riot cops repelled any advance toward Madison Square Garden with a new technique: kettling. By the end of the day, the orange nets had helped reel in over 900 arrests, which included several non-protester passersby. The Times called A31 a “day of disorder,” whereas those initiating direct action could consider it a temporary success, given the national TV coverage generated by the street conflicts. But most of those arrested spent the remainder of the convention at Pier 57. And in the final two days of the RNC, the only notable protests came from inside the Garden, as both Code Pink and ACT UP managed to disrupt the proceedings. As the dust settled, the final tally of those collared by the NYPD reached 1,806. “They might as well just plead guilty and go on,” declared Bloomberg. In his view, “We did as good a job as we could, given the vast bulk of people who came here to get arrested. They were all treated humanely.” He failed to take into account the bystanders who got kettled or the fact that more than 1,500 people spent as many as fifty hours in a greasy bus depot. Over the next decade, the Bloomberg administration would continue to fight the raft of lawsuits it faced for wrongful arrests and prolonged detentions. In January, the city finally reached an $18 million settlement with 500 people arrested at the RNC (several hundred more were included in a class action). That brought the sum total to over $34 million. In announcing the end of the case, NYCLU lead counsel Christopher Dunn said that “we hope and expect that this enormous settlement will help assure that what happened in 2004 will not happen again.” But many aspects of what happened in 2004 resurfaced seven years later during Occupy. Overzealous police tactics — from pepper spray to kettling, re-routing of marches, and reflexive use of petty statutes — were again on display. One key difference was that in the wake of the “Ground Zero Mosque” controversy a year earlier, Bloomberg had suddenly become a champion of the First Amendment. This kept him from wiping out the encampment sooner. But the ultimate clearing of the park showed that the mayor still saw protest as a privilege that could be revoked. There’s little reason to think that any future major demonstrations under the de Blasio administration will be handled much differently — especially another convention. One of his first moves to show a city elite nervous about Bloomberg’s exit was to name Bill Bratton police commissioner. Bratton reportedly said that he would have wiped out the Zuccotti encampment much sooner. Since taking office, de Blasio has generally deferred to the commissioner, most notably by allowing Bratton to undermine the effort of Brooklyn’s new district attorney, Ken Thompson, to decriminalize marijuana. It’s also doubtful that the cost of RNC litigation will deter the NYPD from future crackdowns. Such money does not come out of the department’s budget but instead the city’s general fund. And so as the ten-year anniversary of the RNC approaches, the right to protest continues to be imperiled in New York City. Activists planning future demonstrations should carefully study the legacy Kelly has passed on to Bratton. At the same time, it’s worth recalling that explosive moment when everyone left of center was in broad agreement about the direction of the American empire. And while the people united can be corralled and kettled, the hydra can’t be slayed. Special thanks to Bill Dobbs for his insights and recollections.